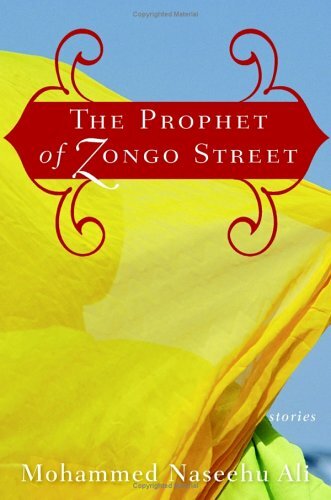 A dazzling collection of stories, The Prophet of Zongo Street takes readers to a world that seamlessly blends African folklore and myths with modernity. Set primarily on Zongo Street, a fictitious community in West Africa, the stories -- which are reminiscent of the works of Ben Okri and Amos Tutuola -- introduce us to wonderfully quirky characters and the most uproarious, poignant, and rawest moments of life. There's Kumi, the enigmatic title character who teaches a young boy to finally ask questions of his traditions. And as Ali moves his characters to America we meet Felix, who struggles with America's love of the exotic in "Rachmaninov." The Prophet of Zongo Street heralds a new voice and showcases Mohammed Naseehu Ali's extraordinary ability to craft stories that are both allegorical and unforgettable. Mohammed Naseehu Ali's gift is to be captivating. I have walked Zongo Street. Mo, thank you for guiding me there. I knew you as a wizard of the drum, I have found you to be a magician of the pen. Your pen dishes out phenomenal images with which I have never before been infused. Your talents continue to astound and impress me. Your real gift is the gift of yourself that you share so candidly. The Prophet of Zongo Street is delicious. Thank you. Now, where can I hear you play again? Will you be drumming at your book signings? Fine Tales Set In Ghana and Brooklyn/Bronx/Long Island !! Needless to say, my favorites were the ones set in or near Zongo Street, in the West African nation of Ghana (formerly Gold Coast). Here we meet a bizarre assortment of thieves, prophets, bullies, tea store owners and their overweight wives,taxi drivers, ghost masquesaders, and many others, including many not much different than you and me. All these tales are beautifully done and just about perfect, and there is some of the zaniest humor you will ever encounter. So, for some really different world literature, why not press the button, and order this collection right now?! This pleasant collection of short stories has something for everyone, especially those who might like to imagine everyday life in West Africa and immigrant experiences in the United States. (The book club average was actually 3.5 stars, but Amazon cannot accommodate half measures.) As other reviews have noted, the best stories take place on Zongo Street, where Ali weaves a vivid tapestry. Many club members felt that the stories based in the US didn't seem as touching. There was almost complete agreement that the story "Rachmaninov" was the least favorite, with some members suggesting the plot line seems derived from the movie "Pulp Fiction". The club was divided on "Live In", some members wishing this story was either longer, or expanded into a complete novel. This is an interesting collection of short stories combined with African folklore. I bought the book to give as a gift along with the movie "The Visitor."